The National Weather Service has issued a winter storm warning currently in effect until today at midnight, February 5 at 12 AM MST. 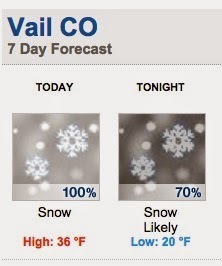 Please take proper precautions and be prepared when traveling up to Vail 2015. For more weather information please visit the National Weather Service at www.weather.gov. Just a reminder, race fans are encouraged to arrive early to have the best chance for a seat in the stands, seating is limited at the Red Tail Stadium. AFTERNOON. SNOW WILL TAPER OFF THIS EVENING. RAIN AT TIMES BELOW 8000 FEET. * IMPACTS...MOUNTAIN ROADS AND PASSES WILL BE SNOWPACKED AND ICY.